Traditionally speaking, the last place you expect to see bold colour in a nursery is on the cot itself. In the cot, yes. On the cot, not so much. 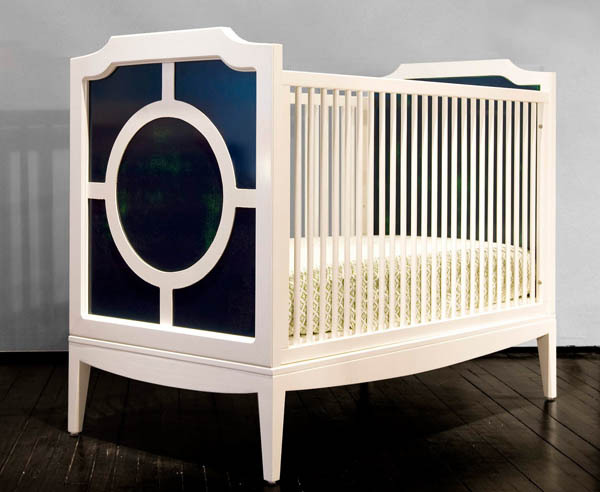 So I love that the cot is the star of the show with The New Traditionalists. There are four cots in The New Traditionalists collection – the Regency, Savannah, Stonington and Georgian. All are equally easy on the eye and will perfectly complement all decors thanks to the genius customised detailing using coloured inserts. The Regency (pictured top) is undeniably fabulous with its classic styling and curves reminiscent of a porthole or the ever-famous Play School window. The contrast of sleek white hardwood frame and the inserts is sensational, the worn navy has a worn effect allowing hints of Kelly green to peek through. Other colours are available. Prices start at US$1350, which may see more people admiring rather than buying! To see all four cots in the range, head on over to The New Traditionalists where you can admire their work in more detail. Don’t forget to take a look at our Chooser to find more innovative cots and cribs for your nursery.